The exhibit hall at Fernbank Science Center spans 9000 square feet and circles the planetarium theater. Split over two levels the exhibit hall has an upper area with 10-foot ceilings and a lower level with 15-foot ceilings. Within these areas are presented numerous displays which deal with a large array of scientific concepts. The theme for the entire exhibit area reflects the slogan of the Science Center: "Where Science Becomes an Adventure." 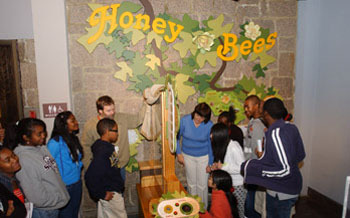 The upper level of the exhibit hall features a live animal exhibit and a live honeybee hive. 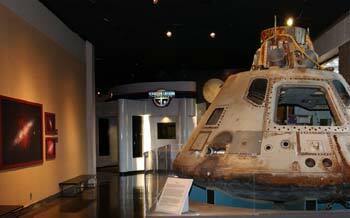 The lower exhibit hall features space exhibits including the real Apollo 6 space capsule and a meteorite collection. 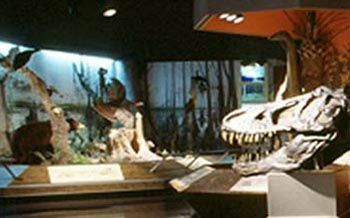 The lower level also houses most of the center's extensive taxidermy collection. The exhibit hall is open daily to the public. Admission is Free! Please click here for hours of operation. An adult honey bee worker emerges from her cell. For worker bees, complete metamorphosis (egg, larva, pupae, adult) takes place in about 21 days. 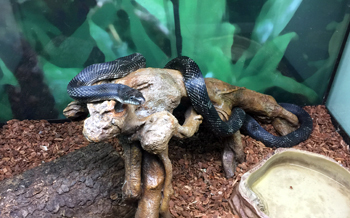 Fernbank Science Center observation hive, May 3, 2018. A Honey Bee worker performs a vigorous waggle dance. Honey Bees dance to communicate distance and direction to sources of provisions such as nectar and pollen. 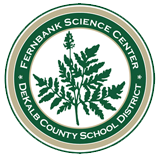 Fernbank Science Center, May 3, 2018. Honey Bee queen inspecting cells and laying eggs. Fernbank Science Center observation hive, May 2, 2028.